TO VIEW PICTURES SELECT AND EXPAND "HISTORY" FROM THE DROP DOWN MENU UNDER "ABOUT"
On May 29 1969- Ron Long, of the Langley RCMP, and Weir Muir, president of the local Royal bank, started looking for members and as they say, "the rest is history". In the fall of 1969, Langley, Surrey and White Rock were little more than rural villages. Ron and Weir, both singers in a local church choir, met in Ron’s living room and discussed starting a barbershop chorus in Langley. They spread the word through their own ranks and around the business community and one night, 25 men arrived in Weir's living room, more than enough to apply for a S.P.E.B.S.Q.S.A license. The majority of our early members were fairly young and just starting out. After some debate “First Capital Chorus” was the chosen chorus name, since Fort Langley was the first capital city of BC – it had a nice ring to it! Forty years later in midsummer 2010, more than a hundred former and current members and friends gathered in Langley to revisit the old times and celebrate four decades of song. Then on May 15, 1970 an Application for Chapter Charter was sent to Kenosha (The Society Headquarters) – with a list of 35 names of prospective members. The Vancouver Thunderbirds were our sponsors. The first meeting place was the Aldergrove Secondary School, after outgrowing Weir's living room. 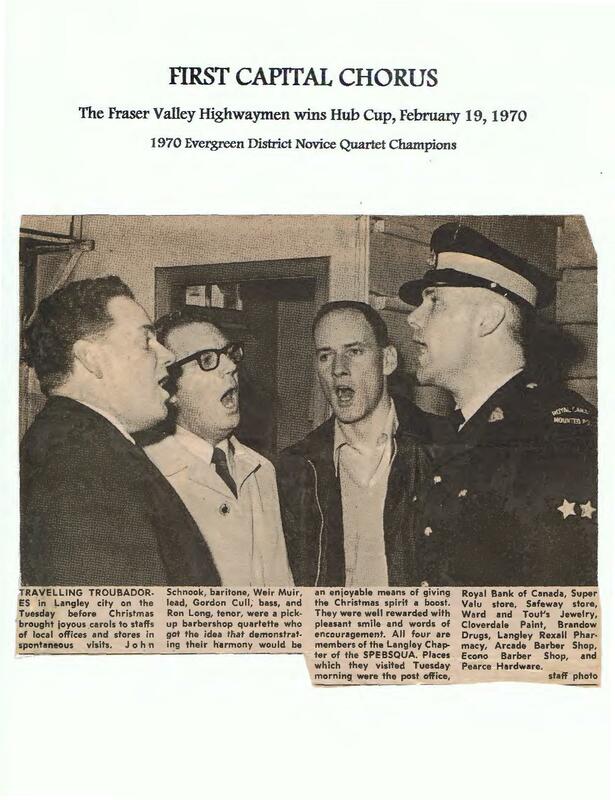 Four founding members: Ron Long, Weir Muir, John Snook and Gord Cull formed The Fraser Valley Highwaymen Quartet and won the Hub Cup (Evergreen District Novice Quartets) in the Murrayville Hall, Feb 19, 1970. That night, Langley First Capital Chorus President Ron Long received not only the Quartet trophy but The Chorus Charter and License from the District and BHS. May 22,1970 was the Official date of Chapter Charter. On May 30 1970 the First Annual Show was held at Trinity Western College. 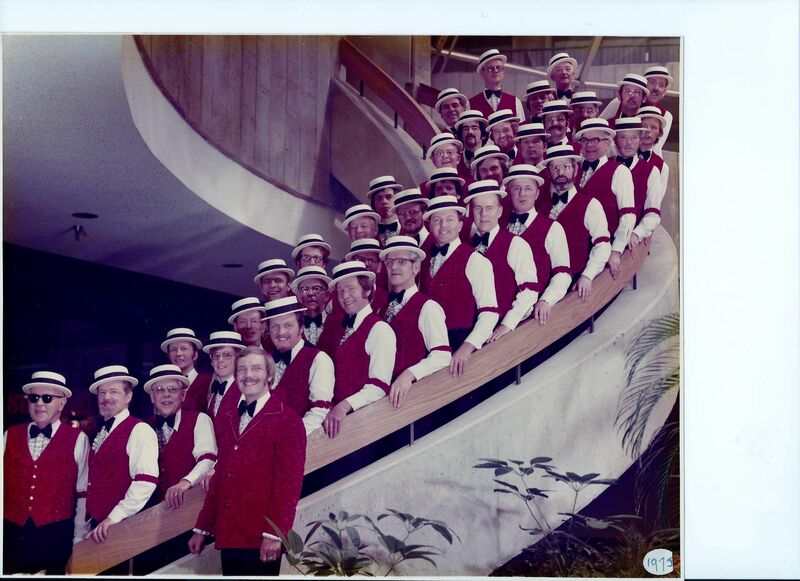 That tradition continued and for many years our annual show was the highlight of the year – with many themes from, “Country Style” to “All Aboard” to “Disney” to “Lookout World for Expo 86” -to” Lover’s Lane” and many more. In the early years, the work of the “Ladies Auxiliary” was a great benefit in the chapter’s life. The many social activities (picnics, house parties) Camping at Harmony Hollow, Big Wheel (a novice quartet contest) gave a strong feeling of belonging..
Over the years our chapter has had several Musical Directors. Each came with his own leadership style and individual personality, but all with the same purpose – to give Langley Chapter the most he could in teaching our style of Music. At peak, the Langley chorus was 75 voices. The Chorus now maintains a roster of 40 active singers, who join in harmony on the risers 50 weeks a year where they have done so continuously for more than 40 years. We sing a few old standards but now the repertoire is filled with Boogey and Broadway, Elvis and Elton, Beatles and Beach Boys. We may never be gold medalists, but we will continue to be the happiest chorus around. It has been said over the years, that if you are looking for a very good Barbershop learning experience and a “fun” group to sing with.... then Langley is the place to go. We are a 45 person choir located In Langley, BC singing in the a cappella style and belonging to the Barbershop Harmony Society! We rehearse each week on Thursday night, put on annual shows, raise money for charity, and even have a recording. We want you to sing with us, attend our shows and enjoy our music ..... so please browse our web site and then get in touch with us!